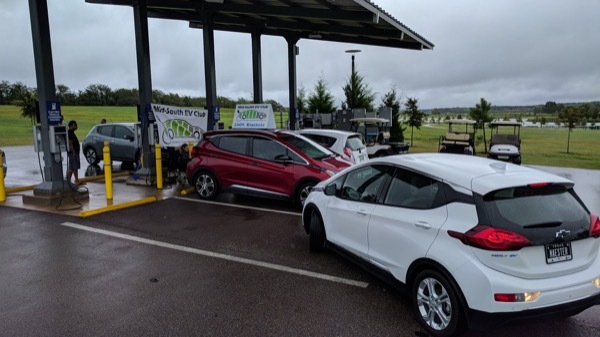 The Mid-South EV Club's participation in the 'National Drive Electric Week' was a great success. in spite of the heavy rains; several EV owners brought their cars, and shared their stories. We had a great time catching up and hanging out. I'm a horrible picture taker. Also, my phone died after snapping the 3rd photo. So, if anyone made any good shots; message me or post them to this page and I'll make sure they get included in a photo album here on the EV club page. A rainy day, but really good EV turnout! "It's shocking what you can do without fossil fuel"
We are meeting at the Solar provided charging stations. Various types of Electric Cars for show and for drives. You will never look the same at an internal combustion vehicle engine again! Registered attendees report 114,400 electric miles driven.